Water Heater | Brooks Plumbing Co.
With winter time here, our minds are on our heating systems—is yours working efficiently? Do you have any repair needs that should be handled right away? These are very important questions, of course, but there is another appliance that often gets overlooked or taken for granted in homes throughout the country, even though it’s needed all year long—and that’s the water heater. Consider the amount of strain that a water heater endures. It works 365 days a year. There is no way you can expect it to work 100% free of problems in that time, particularly without investing in annual maintenance and prompt Olympia, WA water heater repairs as needed. Regardless of whether or not your water heater was maintained within the last year though, there are some symptoms a water heater displays when it is struggling that should never be ignored. Keep reading to learn what these symptoms are. Tank water heaters are usually out of sight, out of mind, and as long as they’re doing their job, we don’t tend to pay a lot of attention to them. This can be a big mistake. The generally wet weather here in Olympia, WA can lead to rust and corrosion very quickly, and problems with your water heater have a way of sneaking up on you if you’re not careful. You can prevent some of it by scheduling routine maintenance sessions from a trained plumber at least once or twice a year. He or she will clear the sediment out of the bottom, replace the anode rod to prevent rust and perform other duties to keep those repairs to a minimum. Hot water is a vital resource, and anyone who has suffered a water heater breakdown can attest to how frustrating it can be to go without it. Many times, those breakdowns can be anticipated and addressed with preventative maintenance or repair session from a qualified Olympia, WA plumber. If you can spot the signs of distress in your water heater, you can schedule a session at your convenience to address the problem, instead of having to scramble once it deprives you of hot water. Here are 3 signs your water heater needs repairs. Which Water Heater Would Fit My Needs Best? For decades, the only real option homeowners had for water heating was a storage tank model. Tank water heaters are units that have large water storage tanks attached to them, some of which can hold over 100 gallons of water. These water heaters keep all of that water heated day and night, just in case someone needs hot water at any given time. While these water heaters were quite convenient in many ways, that they were the only option was less than ideal. Now, there is a new option in the form of the tankless water heater. Let’s take a look at the pros and cons of each of these systems, in order to help you choose the best one for your home. As mentioned above, a storage tank water heater is one that uses a large storage tank to constantly keep a large amount of water heated. The benefits of keeping so much hot water on hand are apparent. Any time you need hot water, you can make use of it. There are a number of cons to using this system, though. For one, you’re wasting a lot of energy keeping all of that water heated when you don’t need it. That leads to you spending more money each year on your water heater for a benefit that you only might make use of. Second, if you ever do exhaust the hot water in storage you’re going to have to wait a while for more water to be heated. These two problems are what tankless water heaters were built to address. Tankless water heaters eschew storage tanks, as the name suggests. Instead, they only turn on when hot water is called for. The water is heated as it flows through the water heater on the way to its destination. The heat output is similar to tank water heaters, so there’s no need to worry about losing heating ability. The pros of this system include energy savings, as a tankless water heater turns off when it’s not needed. There’s also no need to worry about “running out” of hot water with a tankless water heater. However, there are a couple of cons. The first con is that there is a definite delay between when you turn a hot water faucet on and when you start receiving hot water. The second is that if you have a lot of demand on the tankless water heater at once, it can be more easily overwhelmed. If you aren’t sure what kind of water heater would fit your needs better, call Brooks Plumbing. We provide water heaters throughout the Olympia area. Posted in Water Heaters | Comments Off on Which Water Heater Would Fit My Needs Best? You don’t want to be caught on a Monday morning with a shower that suddenly can’t produce enough hot water—or perhaps any hot water. When a water heater fails, it can mean a few days of discomfort for you and your family until a new one is installed. Luckily, water heaters usually send warning signs that they are experiencing problems that call for immediate repairs to prevent a full failure. If you notice any of the problems below, get in contact with a repair specialist right away. You will be glad you took action sooner rather than later. Since 1994, Brooks Plumbing has installed, repaired, and maintained water heaters. You can trust us with whatever problems you have with your home’s hot water supply and your water heater in Lacey, WA. Discolored water: If you turn on a hot water tap, and rust-colored water flows out, similar to what you might see after a long vacation, then the heater is either developing rust or has a build-up of sediment inside its tank. Rust needs to be remedied as soon as possible, or the whole water tank will need replacement. Excess sediment will require that technicians flush out the tank. If the sediment remains, it could start to block the valves in the tank. The water isn’t as warm as before: When you notice that the water coming out of a hot water tap is lukewarm and not up to the temperature level you expect, a number of problems might be afflicting the water heater, such as reduced gas power to the jets or a broken mixing valve. These problems will almost always worsen, so have professionals on the job as soon as possible. 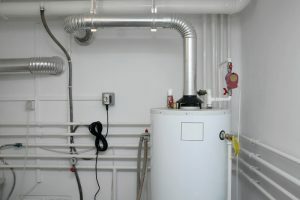 The hot water runs out too fast: On occasions when the hot water supply cuts off before it should, the issue is often due to a broken dip tube inside the tank, which will deposit cold water near the top of the tank and mix it with the hot water that the circulator pump sends out to the taps. The technicians can fix the dip tube and restore your hot water to its regular amount. For any of the above problems, it’s possible that the heater has simply aged past the point where it can work efficiently and effectively, and the only “repair” that will stick is to replace the system with a new one. Your water heater repair technician will give you a set of options and help you select the one that will benefit your home and budget the most. For honest answers and quality work for your water heater in Lacey, WA, call Brooks Plumbing today. We service both storage and tankless water heaters. Why Are There Gurgling Noises Coming From My Water Heater? Generally speaking any unusual noise from a major appliance is cause for concern. This is just as true for your water heater – which rarely receives any attention except when something’s wrong – as it is for any other appliance. Gurgling sounds, in particular, are common signs of a significant problem with your heater. “Why are there gurgling noises coming from my water heater?” you ask. Any plumber in Olympia can give you an answer en route to making speedy repairs. Gurgling noises usually result from water passing through sediment and build-up on the bottom of the tank. The sediment builds up slowly over the course of time, fed by mineral deposits in hard water that enters the tank. Hard water is usually harmless, but the minerals (usually calcium, magnesium and the like) will settle into the bottom of the tank and may even create strange little structures as they form. When water moves through them, it will gurgle and bubble, creating the noise. This might not sound like a big deal – and indeed, the water heater will usually still function – but it constitutes a significant problem. The sediment forms an insulating layer between the water in the tank and the heaters intended to warm it. That means your water heater must burn more gas to do its job, costing you money and increasing strain on the bottom of the tank. If left untreated, it could eventually cause a breach in the tank, forcing you to replace the entire unit. The good news is that a trained plumber in Olympia can help. Draining the tank and cleaning off the sediment is a fairly standard operation for most plumbing services, and some companies can install water filters in your home to cut down on the build-up. If you’re wondering why there are gurgling noises coming from your water heater, then contact the plumbing experts at Brooks Plumbing. We’ll fix the problem and can help you take steps to prevent it from recurring in the future. Pick up the phone and give us a call today. You’ll be glad you did! Posted in Water Heaters | Comments Off on Why Are There Gurgling Noises Coming From My Water Heater? Your water heater is old. You may have a warranty on your existing water heater and if it’s well maintained, it should last for a long time. If it’s over ten years old, however, and evincing other problems, then replacement may be your only option. Repairs costs are mounting. If your water heater is showing signs of rust or corrosion, if the pilot light steadfastly refuses to stay lit, if puddle of water repeatedly appear on the floor, or if scaling and sediment build-up are creating problems in your system, the cost of fixing them may no longer be worth the aggravation. While the initial set up fee for a new water heater may be expensive, you’ll see returns with lowered monthly heating bills and a lack of repairs. When it comes to water heaters in Olympia, WA, Brooks Plumbing has the expertise you need. We’re locally based, so we understand the needs of Washington home owners, and our trained Olympia, WA water heater technicians can install a new water heater before the winter storms arrive. If you have reasons to consider replacing your water heater this fall, contact us to make an appointment today.